I used to be a big activist. 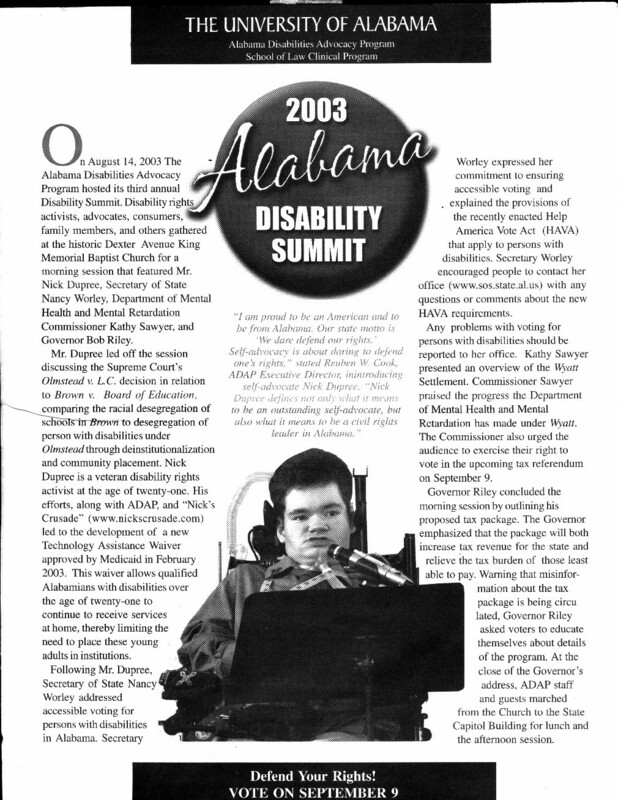 I made a national splash fighting Alabama Medicaid’s arbitrary cut off at age 21 (NPR story here) in a campaign dubbed “Nick’s Crusade.” It was years of legislative work, followed by half a year of lawsuit work, and a sustained internet and media campaign throughout. I saved myself, my brother and several others from having life-supporting services terminated. After I “won,” I spoke at conferences throughout the country about advocacy (like the keynote at the Chicago TASH conference, and, in one of my proudest moments, delivered a speech on civil rights in Martin Luther King’s old church). Everyone thought “this is a talented kid that’s really going somewhere.” But I didn’t have enough help to go far. My situation was deteriorating, and with the support of my partner, and an internet fundraiser coordinated by the Ophoenix Public Benefit Corp. in San Carlos, CA, I was able to fly out of Alabama on August 28, 2008, and am now living at a city rehab hospital in New York City until I can get home care in place. UPDATE: I left the rehabilitation hospital in September of 2009, and now live at home in the community with my partner. I’m rising from the ashes, yet again. I’m starting over in New York. This blog will chronicle my various adventures and insights. Nick’s Crusade has moved to nickscrusade.org! If you like my blog and would like to see every new post, a great web tool for following blogs is http://www.feedmyinbox.com/ You simply insert the URL of the blog ( in this case, http://www.nickscrusade.org/ ) and it automatically emails you the new blog posts. My first lengthy post is Lucky Unit 13 (Long Essay on Institutional Living. Check it out.